First on the list of things to do in Salta is to hop on the “Train in the Clouds” (El Tren a las Nubes), probably the province’s most internationally well known event. Soar along the tracks to above 13,000 ft. and watch the clouds go by beneath you. If you are lucky, you will also see condors gliding gracefully near the peaks. The railroad is the third highest in the world and is considered one of the most amazing feats of engineering of the 20th Century. Richard Fontaine Maury, an American engineer, built the track in 1921. Its primary purpose was to connect Chile with Argentina to handle trade between the countries and give Argentina an outlet to the Pacific Ocean. 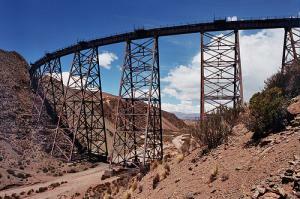 Today, however, its destination is La Polvorilla viaduct which is 13,850 ft. above sea level. The 434 Km. round trip takes about 15 hours as it laboriously winds its way up the mountains and back. On the way, the changing scenery is spectacular. Riding the train is therefore an all day event. On board services include interpreters, restaurant car, panoramic cars, live folk music, videos and a first aid post with a doctor and. 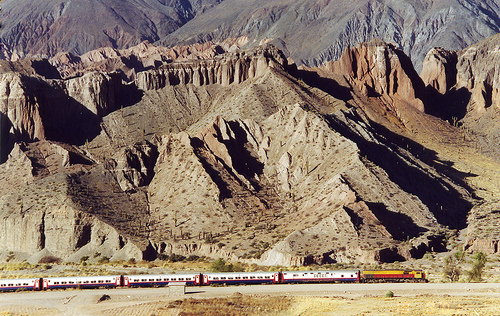 The train leaves once a week from General Belgrano station in the city of Salta. By the time you return you will have crossed 29 bridges, plunged through 21 tunnels, ridden over 13 viaducts and zigzagged your way there and back. The zigzags allow the train to climb the slopes more easily. Passengers can get off at each station to stretch their legs and check out the wares of local inhabitants who flock to the train to sell their goodies. Some handicrafts are worth buying, but many are not. Choose wisely. 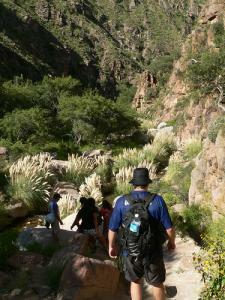 Salta is ideal for trekking tours. For beginners there is a one-day tour just a few minutes away from downtown Salta City. Expert bilingual guides take you through jungle-like vegetation starting at the foot of San Bernardo Mountain and then along the edges to San Lorenzo hill top where you can gape in wonder at the Lerma Valley with its rivers and the Andes in the background. After a light lunch you return to the city. Other tours range from 2 days to a week in different regions of the Province and go from easy to highly professional. Go to www.saltaaventura.com for a few more ideas. Beginners should check with the tour leader for what kind of trekking ware you will need. Usually it can be provided by the tour operator. Nature, Beauty and Adventure rolled into one. Four-wheel drive tours are a wonderful way to get to know the incredible topography of the province while having fun doing it. 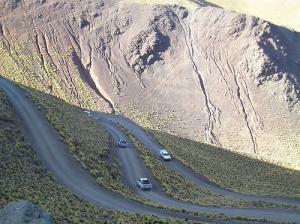 If you are new to driving across difficult terrain, there are basic tours that are fun to do. If you are more professional, you will find places to test your skills you never dreamed of. 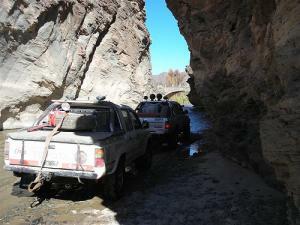 The Marlborough rally event took place in this region just because of its difficult terrain. Either way, you have tours that go from 900 m above sea level to over 4000 m. Every region has its own specific climate and terrain. It can be 28 degrees Celsius in Salta City and 10 below zero at 4000 meters high. You can do both in the same day. The tour from Salta to San Antonio de los Cobres, for example, takes you 380 Km across some rouge country where you will be able to see guanacos (a type of llama), cacti with the strangest of flowers and flamingos by the thousands in all their colorful glory. Lagoons, vast salt flats, dry river beds (except in summer), rolling sand dunes, the Calchaqui valley with Indian ruins and tiny villages and precarious mountain roads among others. It is always best to take an expert guide with and if possible two cars in case of emergencies. The Cabra Corral damn and reservoir, 84 Km. 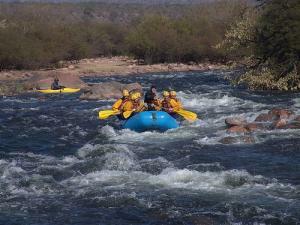 south of Salta City, on the Juramento River is the start line for white water rafting in tough, rubber boats. The boats can carry from 2 to 10 people. For the more adventurous, kayaks are also available. The rapids on this river are class 2 and 3, medium torrent. You may choose to take one of two tours: The first is short at 15 km lasting two hours while the second is longer at 35 km lasting five hours. Tour operators supply all the necessary equipment, transfers (on request) and, in some cases, refreshments too. Farms and ranches are plentiful all over Argentina. Salta is no exception. For those interested in inspecting them first hand and even taking part in some of their daily chores, there are many choices. For those who wish go horseback trekking, there are also many opportunities. Spending day on the ranch is also a great way to sit back and savor the best BBQ or asados, in the world while drinking excellent wine. Riding comes in three main levels of difficulty from easy to almost impossible. Excursions can last half a day, all day or up to four days. The riders pass through wonderful scenery that includes mountains, forests and flatlands. This page rendered in 0.83 seconds.